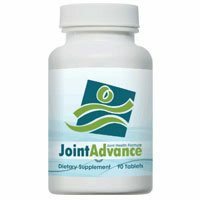 Joint Advance is a dietary supplement that combines known joint supplements together with other potent herbal ingredients in order to improve joint and cartilage condition. The problem of most middle and late stage adults is related to joint pain and stiffness. It is because as people age, the condition of their joints also degrade. It can no longer cope up with the active lifestyle that a person had been accustomed to before. But the formulation of Joint Advance promises to help the body recuperate and rebuild the damaged joints, tendons, and cartilages. It helps improve mobility and flexibility. It helps reduce joint pain and stiffness. It also reduces joint and muscle inflammation through the combined effect of ginger and glucosamine. It helps replenish the fluid between the joints to reduce friction with each movement. Joint Advance is manufactured by a company that has been awarded the GMP (Manufacturing Practice) status due to its commitment to making quality supplements. The company is also a member of the Natural Products Association. Interested users can buy the supplement from the manufacturer’s official website. It contains both potent joint ingredients as well as herbal ingredients. The formula of the product is conceptualized in way that they will work synergistically in order to effectively improve joint condition. It replenishes the nutrients in the body that are needed in maintaining healthy and strong joints. It may help improve mobility and flexibility by reducing joint pain, stiffness, and inflammation. The combination of glucosamine and chondroitin has been studied to be effective in reducing joint pain related to arthritis. The combination of glucosamine and ginger has been found out to be effective in reducing joint pain. Its effectiveness is even equated to relief brought by taking Diclofenac (a nonsteroidal anti-inflammatory drug that is well known for its analgesic effect. The combination of MSM and ascorbic acid boosts the immune system and helps speed up the healing process of the body. You would have to take the supplement initially for a continued period of 6 months to maximize the benefits of the product. There is no published research or clinical trial that includes and justifies the effectiveness of Joint Advance in reducing joint pain, stiffness, and inflammation. Joint Advance is needed to be taken three times in a day which will be a bit burden for older people (who usually are the consumers of the product) since they will have difficulty swallowing the tablets. It has certain interactions with some anti-hypertensive medicines, hypoglycemic drugs, thrombolytics, and other prescription medications. The manufacturer recommends a daily dose of three tablets. Each tablet is to be taken three times in a day with meal. It is advised to take the supplement with meals to reduce the chance of gastric upset and also to not forget taking the supplement. However if one dose is missed, it will be fine to take the missed dose as soon as you remember it. Since one of its ingredient, White Willow Bark, causes Aspirin like effect. The product should not be taken by children, pregnant women, and mothers giving breastfeed to their child. Joint Advance has not been recommended and prescribed by the medical professionals as a long-term treatment for arthritis or joint pains. It is advised to seek advice from your physician prior to taking this supplement especially if you have an existing condition, currently taking prescription drugs, or is undergoing any form of medical treatment. Joint Advance is a dietary supplement that contains the basic ingredients that you will find in other joint products. There is no proprietary recipe behind the product that will really set it apart from other supplements. Although some of the combinations of the ingredients have been studied to be beneficial in joint pain, the entire recipe of Joint Advance has not been put into an in-depth research itself. When purchasing a product especially when it relates to health, you should scrutinize every detail and always go with the best that you can find.